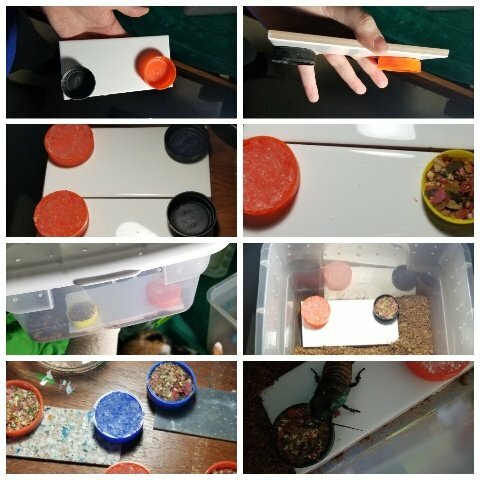 So my roaches are spoiled and they have these little feeding stations that I made. I realized that they're actually helpful! So I hot glued bottle caps (Gatorade ones because those are big) to tile samples from Home Depot. I put water gel in one cap and the dry food mixture in the other. It reduces mess, has easy access for the roaches, looks super cute, but most importantly NO MORE MOLD! I put their fresh fruits/veggies on the tile because it's easy to cleanand then the mold frm the fruit doesn't go on the eco earth but with the caps glued down the dry food no longer gets into the water gel so there's no mold from that! It also looks really cute. Clever idea gluing the dishes to the tile so they stay in place and don't tip/get substrate knocked all in them. I have a small species of roach and the nymphs can't climb slick surfaces so I ended up getting a Zoo Med repti rock food dish. It works great because it has texture so the tiny nymphs can climb over the ridge and in. Since I have substrate in the tank I make a slop in it so the dish is at an angle. This allows any roach that accidentally ends up on its back to easily flip back over. My crew eats too much for the fruit to have time to mold. I put in something like a half a banana, large hunk of apple, hunk of carrot, and zucchini and after two days everything is gone but dried husk of apple skin. Little pigs.